Oh, friends, what a lush, gorgeous, beautifully sentimental [and 50% true] movie directed by Ethan Hawke and co-written by Sybil Rosen and Ethan. It is so fantastically written. A number of lines—and their philosophical depth—took my breath away. I had never before even heard of Blaze Foley, but what a tremendous songwriter. Despite reminding me of a number of obvious country/western legends, his troubled mind and heart also remind me of Scott Hutchison. I'm a little too tired to do the film justice with a write-up, but suffice to say it's a quiet, noble, humble, wonderfully told story. And Ben Dickie is, hands-down, a gift to cinema. So natural, so easy, so authentic, so fresh, so insanely musically talented. 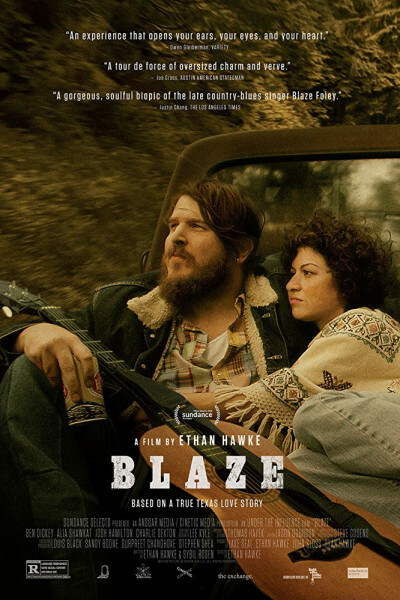 Blaze is, first and foremost, a love story, filled to the gills with wandering, wanting, and loss. It just haunts and haunts and haunts, and there is a simple little wedding scene—with a boy on a rope swing—that will linger in my mind and memory for days, if not years. p.s. It's also got Kris Kristofferson, Richard Linklater, Sam Rockwell, Steve Zahn, and [former child musical prodigy] Charlie Sexton (here portraying Townes Van Zandt, writer of 1972's classic, Pancho and Lefty). You may remember Charlie's face from Thelma & Louise or Linklater's 2014 coming of age saga, Boyhood. If the film only had Matthew McConaughey, too, it would likely be the largest ode to Austin's soul in recent memory.